It’s a pretty boring week–health care and Supreme Court confirmation hearings. Now don’t get me wrong, they’re very important…but they’re about as exciting as watching watching a brick pile. Will the public option be watered down so the health insurance companies can continue to make obscene profits? Will there be any meaningful attempts at lowering costs? Will that happen before 2013? Then there’s the Sotomayor hearing. First of all, there’s no way she will not be confirmed. Even the Republican senators seem resigned to that–they don’t have the votes to deny confirmation. There’s nothing in Sotomayor’s record that paints her as a flaming liberal–or even all that liberal at all. The more I hear, the more like a centrist she seems to have behaved. Now that might change. Lower court judges have to follow the rules, while Supreme Court justices make them. But sometime ago when Obama said he wanted a centrist court, I took that as a clue that he would appoint centrist judges. Not that that would center the Alito court very much, if at all. But it would make Obama more likable to the right-wing–except that it won’t make up for his being (sarcasm alert) an America-hating Muslim who isn’t even a natural born citizen. (Already one soldier is refusing deployment on the grounds that Obama isn’t really President--I think his request should be granted–on the grounds that he qualifies for a Section 8 for denial of reality.) So where does that leave the Republican grilling? Why back at the Rush Limbaugh barbeque. Rush says that Sotomayor is a racist, so let’s pull out our racial bonafides and prove we’re just as big a bunch of yahoos as the Rushster is. Or Pat Buchanan. So Tom Coburn makes a cute Ricky Ricardo reference, pronouncing “explaining” as “‘splainin” like the Cuban bandleader did. Except that Desi Arnaz was “zaggeratin” his accent. And he wasn’t a Puerto Rican, but a Cuban (but what the hell, all Hispanics sound alike, don’t they?) And it was HIS OWN accent he was mocking. There was another “Hispanic” popular a bit later, José Jimenez. Only he wasn’t a Hispanic, he was an American of Hungarian-Jewish descent named Bill Dana. Very popular in the 60s with Anglo audiences. When Spanish-speaking groups began protesting his performances, he found out just how funny they thought he was. Dana publicly dropped the José Jimenez routine (in 1970) and about 12 years ago was honored by National Hispanic Media Coalition with an award celebrating what his act of disavowal did for the Hispanic community. 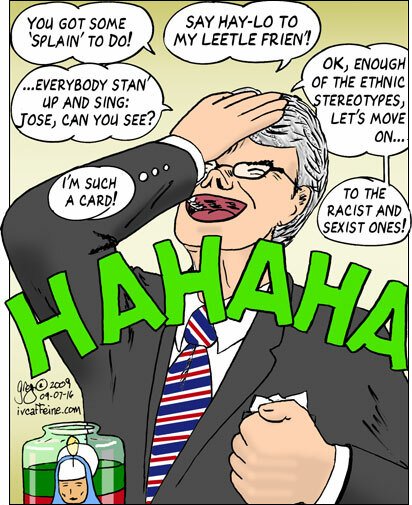 But that must have been after Tom Coburn stopped watching TV. He still thinks “I Love Lucy” is the bee’s knees.